Vehicle combat games used to be extremely popular, but they’ve since fallen by the roadside. I used to play Twisted Metal and Vigilante 8 for hours on end, so I jumped at the opportunity to review the new vehicular combat MMO, Crossout. This high-octane game’s motto is: Create Ride Destroy, and it doesn’t take long to discover that these are the most enjoyable aspects. While a few other features are done well, the mission structure is severely lacking and the MMO aspect reminds me of a stripped-down Yugo. In the not too distant future, 2021 to be exact, a mysterious viral epidemic quickly ravages the planet. 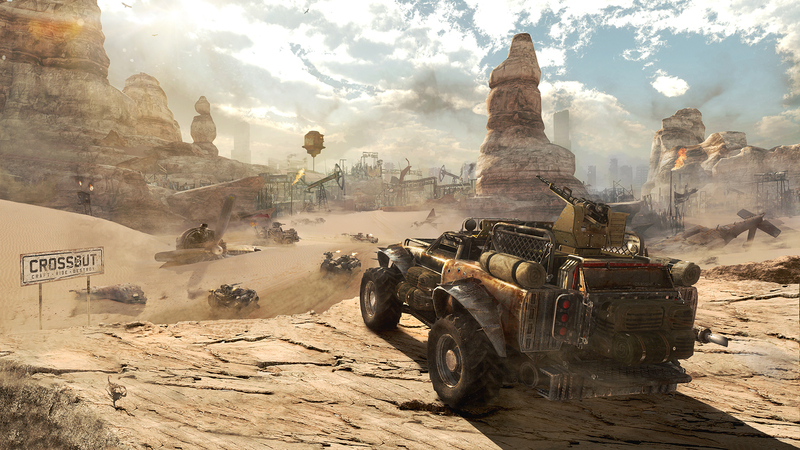 Dubbed the “Crossout,” this epidemic killed millions and drove many survivors mad with intense headaches and hallucinations. No one knew what caused the disease, but it was an apocalypse of epic proportions. Twenty years later, the survivors roam the wasteland searching for any way to survive. Apparently, this means constantly striving to have the best vehicle and then blowing the crap out of anyone who even looks in your direction. What’s really sad is that few players will discover that the story takes a convoluted turn that involves alien involvement in human evolution, genetically-enhanced super-soldiers, and a multi-dimensional universe. I wouldn’t have even known these details if I hadn’t read the story on the official website. “Why is that” you ask? Because I haven’t seen a single thing about the story since the very beginning. MMOs are supposed to be story-driven, but players can hop into this game and play their hearts out without ever knowing a single detail about the story. Lack of story-driven material combined with an incredibly small set of lackluster missions are Crossout’s biggest problem. After playing for over 30 hours, I’m still stuck repeating the same seven missions. They basically consist of 8v8 PvP team deathmatch-style matches that also let one side win if an enemy base is captured. In addition, there are also a few PvE raids where four players team up to capture dropped cargo, destroy towers, or fight against boss vehicles and their minions. I would play this game for longer sessions if there was more variety in missions, but I quickly grow tired of grinding the same ones over and over. The sheer variety of weapons is almost overwhelming. So far I’ve built vehicles with machines guns, shotguns, cannons, auto-cannons, giant spikes, and spinning sawblades. I’ve also seen other vehicles sporting unguided rockets and explosive spears and others still releasing stationary and flying drones. Some of the incredible end-game weapons include artillery, homing missiles, and flame throwers. I can’t wait to craft giant Leviathans with extensive armaments! Eight levels of post-apocalyptic wasteland are available for players to enter for combat. These levels have a great variety of both standing and partially-destroyed buildings. I also like how they have alternate paths to use, so there’s more than one way to get around. One of my favorite levels has a gigantic drilling machine as the focal point with smaller equipment scattered around. All eight levels are fun to play in, but they would be better if everything wasn’t static. It would thrilling to crash through houses and/or ram enemies into buildings and have them topple down. 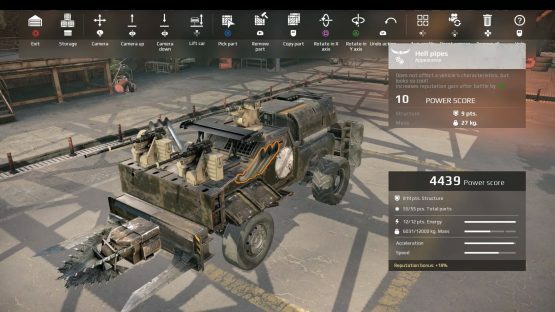 I’ve literally spent more time creating vehicles in Crossout than I have driving them, but that’s not a bad thing. In fact, this is the most robust and enjoyable construction that I’ve encountered. With hundreds of parts that range from weapons to frame pieces to gadgets to tank treads, the possibilities are nearly endless. There are some freaky creations out there that I never would imagine building, such as a crab vehicle that traps enemies while the driver riddles them with bullets and a tank/truck hybrid covered in armor with dual cannons on the front fenders. This kind of creativity makes me nostalgic for my youth, when I crafted vehicles out of LEGO sets and Tiddlywinks. There’s a lot of strategy to building vehicles, and most of it is learned the hard way, through practice. Some people prefer fast vehicles with light armaments while others prefer slow-moving, heavily armored metal beasts that are armed to the…err…grill. I prefer something in the middle that has the ability to focus fire in one direction, as it has proven to kill enemies quickly. Another layer of complexity is added by various hardware such as a radar, weapon cooling radiator, generator, rocket booster, and even a cloaking device. Vehicle parts are rewarded for successful missions and raids, but nearly everything can also be crafted. It takes a long time to gather the necessary resources to craft high-quality gear, but that’s to be expected from a free-to-play MMO. After reaching level 10, players can join specific factions that offer exclusive parts to members. What’s cool is that players can join any or all factions and earn parts simply by raising reputation with them. This means that eventually, players can earn every single part that all factions offer. Surprisingly, this MMO doesn’t provide players with any way to actually interact with anyone besides seeing them in a match and either teaming up or blowing them up. Sadly, there’s more social interaction on the forums than in the game. The main MMO portion of the game is the “Market” that lets players buy and sell vehicle parts online. Other than that, players can enter the Exhibition area to see other player’s vehicles and download their blueprints. This is a really cool feature because it provides ideas and inspiration for new vehicles from people around the world. There’s also a clan feature that lets player team up and battle other clans for precious uranium ore. This ore is used to craft high-end weapons. Like all MMOs, Crossout has it’s share of problems. One of my main gripes is the fact that inverting the aim in the game doesn’t affect the vehicle builder. As a result, I’ve spent way too much time adjusting my aim and compensating for incorrect movements. I also don’t like how players cannot choose the servers they join. I’ve played in numerous matches where gameplay slowed down to a crawl and even stuttered due to lag. I’m confident that the developers will fix the problems with this game because they quickly fixed the launch problems by adding more servers and fixing the Market. Crossout reminds me of the first vehicle I owned, which was a 1970s Volkswagon Beetle hand-me-down. It didn’t look like much at first and it definitely had its share of problems, but I had a lot fun driving it. Soon I discovered that the more time I dedicated to fixing and upgrading it, no matter how monotonous, the more fun it became. Some problems were never fixed, but eventually I was proud enough to take my custom car out in public and show it off. Review code for Crossout provided by publisher. Reviewed on PS4. For more information on scoring, please read our Review Policy here.